Specially designed for today's on-the-go technology enthusiast, whether the task is photographing family travels, traversing campus, or taking a day trip around town, the compact Fastpack 100 can carry a digital SLR with zoom lens attached, plus an extra mid-range zoom lens or flash unit, MP3 player and provides plenty of space for personal gear. Outfitted for work, travel or play, the 180-degree access panel in the Fastpack makes loading and retrieving camera equipment quick and easy, while adjustable dividers enable its compartment to be fully customized to fit different combinations of gear. 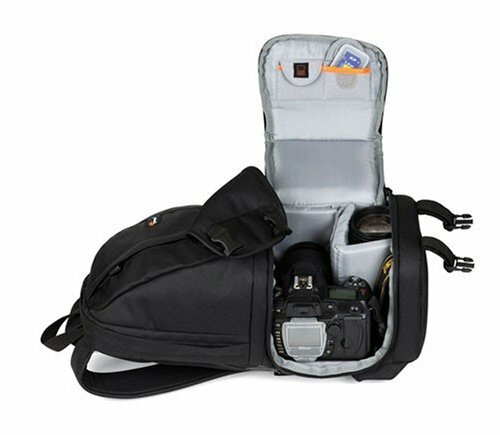 With its security flap snapped closed over the camera compartment, Fastpack offers an additional layer of security for valuable photography equipment while maintaining fast-access through the side entry compartment even while the pack is being worn. The top compartment provides ample capacity and puts personal accessories at the consumer's fingertips. With the compatible pouches, SlipLock accessory loops add even more external storage capacity and the mesh side pocket holds a water bottle, car keys or other essentials. 180-Degree access panel with adjustable dividers provides excellent protection in a customized fit that's easy to load. The Fastpack 100 is the smallest of Lowepro's Fastpack series. I like the small size for long walks around town. The Fastpack 100 is significantly smaller than the Fastpack 200, so I do not have to worry about bumping in to people on the sidewalk or when standing in a bus. My Nikon D40 with 18-200 zoom lens fits fine in the camera compartment and there is an additional padded pocket for a flash or second lens. If you're carrying more lenses, you should get of the bigger Fastpack bags. I bought this for my new SLR Camera Nikon D5000. My camera fits perfectly with the attached lens Nikon 18-55mm VR DX. You can even fit another lens in the generously padded compartment. Other than that, I also managed to fit in an additional SD Card, SD Card reader, 2 battery packs, battery charger, 2 cables, cleaning accessories, a bottled water on the side pocket and a lunch pack on top of the small compartment. Everything just fit snugly and compact, which I prefer. Definitely a must to have! The Backpack is solid, well built and is good protection for my equipment.